Upon arrival, check into a double Prestige room at the 5* Sources de Caudalie, delighting in the sumptuous surroundings of this charming vinotherapy heaven. On arrival, we would be delighted to arrange a surprise for your lover, with a bottle of Champagne, rose petals and candles awaiting your arrival in the room! A supplement of £129 applies. The remainder of the afternoon and evening will be free to relax and do as you please. We would be pleased to reserve you a table for dinner if required. 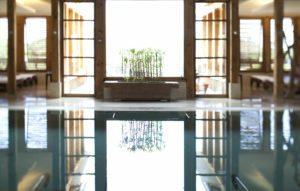 After breakfast, the morning will be spent enjoying the hotel’s award-winning spa facilities. Relax in the oasis of peace at the world-famous Vinotherapie® Spa, with access to the thermal baths and steam room. You’ll enjoy a bubbly barrel red vine bath together, complete with exfoliating grape marc! If you’d like to arrange a gift for your lover, a selection of Caudalie products can be presented following the spa for a supplement of £39. 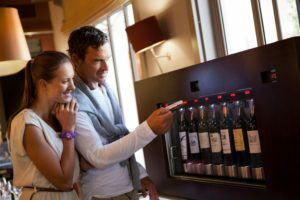 Following your relaxing morning together, you’ll then be welcomed at Château Smith Haut Lafitte, for a tour of the cellars and vat room, followed by a tasting session of two of the Château’s wines. There will be free time to relax before dinner. In the evening, delight in a delicious five course dinner in the hotel’s gourmet garden inn ‘La Table du Lavoir’. Please note, drinks have not been included as part of the package, and can be ordered and paid for on the day. After a leisurely breakfast, check out of the hotel, and at your own pace commence your return journey. 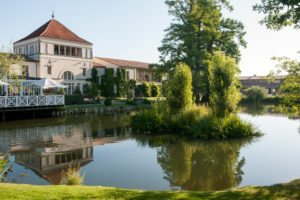 Les Sources de Caudalie is located around 20 minutes from Bordeaux amongst the vineyards of Château Smith Haut Lafitte in the Graves appellation. The architect Yves Collet created the hotel’s contemporary buildings from scratch from recycled local materials to maintain harmony with the surroundings. Caudalie’s world-famous Vinotherapie® Spa offers a large variety of exclusive treatments in an environment of rare beauty. 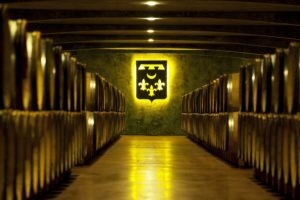 The refined atmosphere of the treatment rooms, the blend of noble materials uniting wood and stone, and the size of the building, reminiscent of an old tobacco kiln, were all designed to harmonise perfectly with the great landscape of the vineyards and give the relaxation lounges a distinctive style. Unique treatments combine the virtues of natural hot spring water drawn from 540 meters beneath the earth – rich in minerals and oligo-elements – with the most recent scientific discoveries of the benefits of the grape and the grapevine. Les Source de Caudalie’s 40 rooms and 9 suites are named and decorated in keeping with different facets of the Aquitaine region. Various room grades are offered from Comfort to Suites and each room has its own individual personalised and enchanting atmosphere. 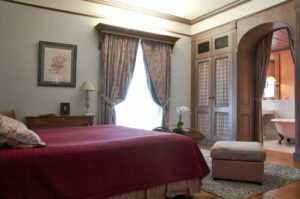 The total price of this package, based on 2 people sharing a double Prestige room is £660 (GBP) per person, and includes 2 nights’ bed and breakfast accommodation, spa access with bubble bath treatment for 2, 1 winery tour and tastings, and a 5 course dinner excluding drinks. Available on alternative dates on request.